Home The story about Batman	Why a Friesian? Ever Since I was a little girl, the Friesian breed had always fascinated me. I remember reading the horse magazine Wendy when I was around 10 years old and every time they had a Friesian horse in the magazine I was so happy! Every now and then they even had Friesian posters! I hang them all on my wall. I also remember a Halloween issue featuring the black pearls like it was yesterday. I read that issue 1000 times, haha! I was completely in love with the long manes, feathers, powerful movements and kind eyes. I watched hundreds of videos in YouTube and read so much about the breed. When I even had my own Piczo site (who remember Piczo?!) 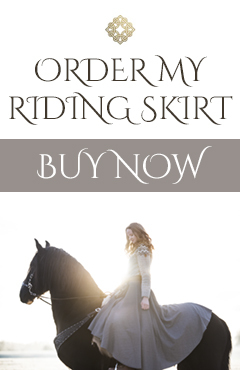 with a page for my dream horse on it – a black Friesian gelding of course! 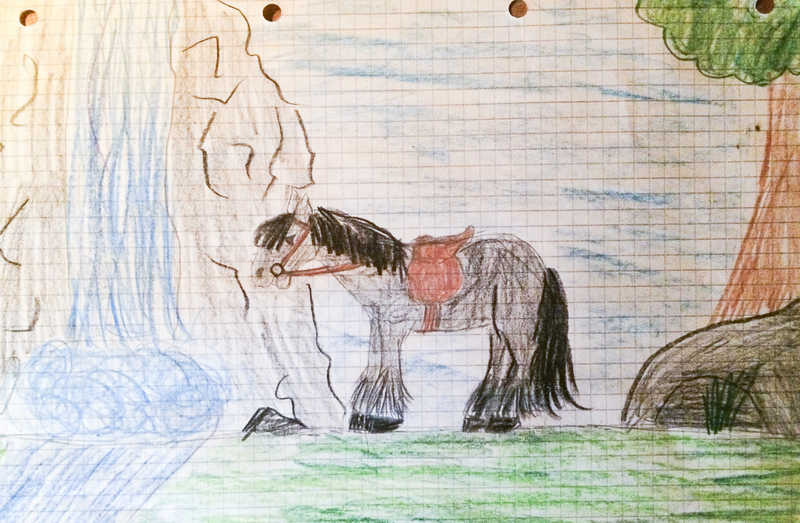 I also drew Friesian horses. 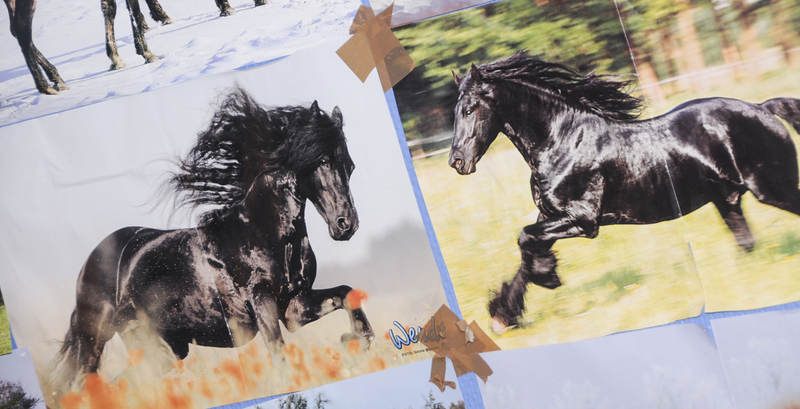 Hundreds of drawings featuring Friesians inn every envoirment possible with both English and western tack, haha! it’s very cute to look back on that now. The first time I saw a Friesian in real life, was on Oslo Horse Show ten years ago, I remember the entire performance so well! I had goosebumps all over. I was completely obsessed! When my sister got her first own horse, I had no idea about what kind of horse I would look after myself. I was open to everything and looked at some warmbloods, but was not very impressed. I also tried a Norwegian coldblood trotter, but he was too small. I was interested in finding a Norwegian Dolehorse, but it was impossible to find anything near 150 cm. It all seemed pretty impossible. A Fjord would also be great, but unfortunately they are also very small .. And I am 184 cm tall. How could it be so hard to find a horse? Nothing is impossible, and today I’m the proud human standing beside my very own, stunning Friesian gelding. The whole story about how I found Batman will be written very soon! The point is: dreams do come true. My childhood dream is now my very own horse, and he is twice as maginificent as the Friesians on the posters from my wall when I was a little girl. 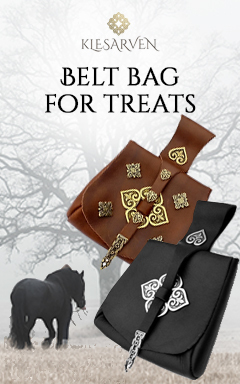 Do you have the horse you dreamed of as a child? Ahhhh, thats gorgeous :) Thats what I dream too. Can not wait for the story of how you found Batman :D I have pictures of Batman and friesians in my room. I love it!! And cannot wait to hear the story of how you found him. 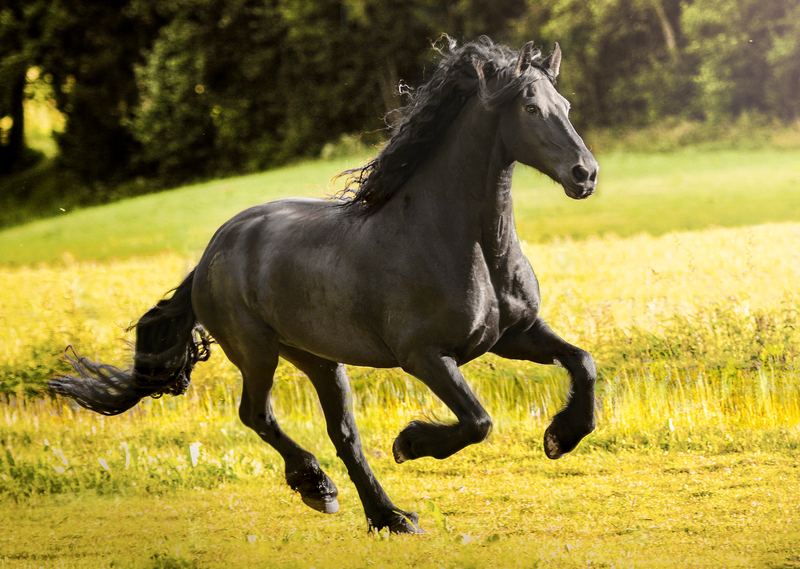 I was the same way with arabians ever since I saw the black stallion! I was that crazy horse girl in school and with my friends. But I am so happy with my 3 Arabian mares, none of them are black stallions but they are all perfect! I agree! I got the horse I dreamed of as a child. Dreams do come true, what you think about you bring about. Thanks for sharing! I have had so many dream horses and still do, haha! I always loved arabians and owned one, welsh cobs quickly became a favourite after my now horse best friend came into my life almost 12 years ago. Thoroughbreds really do it for me though, one of those are definitely top of my wish list! And preferably a chestnut one with white markings *dies*. I could go on forever , haha. So awesome ♥love it. I hope one day it’ll happen to me! I dreamed about pinto horses ! Then there was an Appaloosa ♥ and now I fell in love with Barock Pinto ! I agree. I was obsessed with horses as a child. 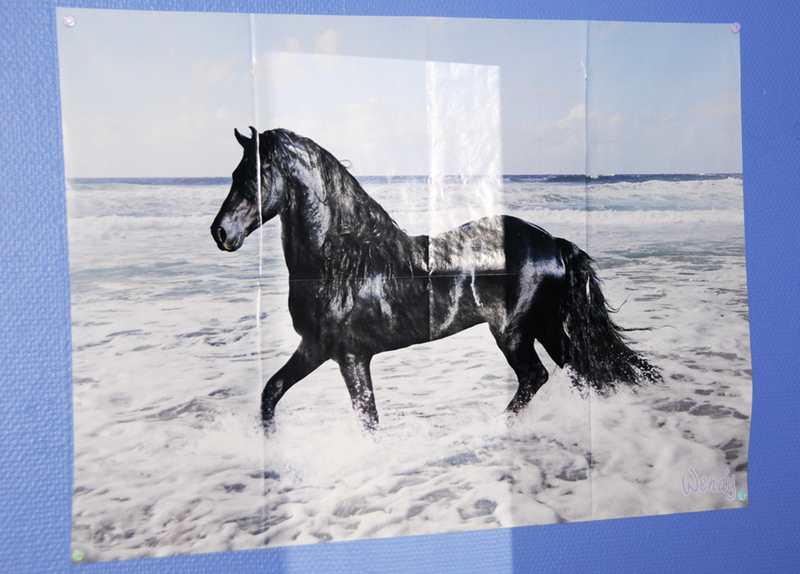 I had Arabians all over my walls and I really didn’t care what kind of horse I could have. My parents surprised me with a 13 mo old quarter/Arabian named Moseby out of a grey arabian named Greyghost. We grew up together and I miss him so much. 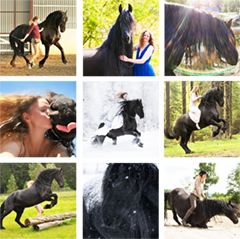 I would love love to have a Friesian or Andalusian but I do not think it will happen. I just recently saved two beautiful Arabians and I hope to do some wonderful things with them. Thank you for sharing your experiences with Batman. You both are truly inspiring. I can’t wait to hear how you and Batman came to meet! When I see your pictures I always feel that you two are meant to be together. When I was young I know I always dreamed of a horse of my own. I cannot remember if I ever had a specific horse in mind, all I wanted was a horse to love. Lancelot came into my life almost by accident and when I first met him I wasn’t even that taken with him, for some reason beyond my understanding, he was so sweet and I liked him but didn’t feel that instant connection. At the time I didn’t understand but now I know he was the horse I needed he is the reason I am who I am and I now love him more then I could have ever imagined. When I was little, I dreamed of a black horse with a white mane and tail. I decided I’d call him Midnight Snow. Even back then I knew that that color combination was impossible. Fifty years later, I fell in love with a black and white Paint horse. It was only after buying him that I realized that if you look at just his head and neck (all black) and his mane (white) that he is my dream horse from when I was a child. You can see photos of him at http://www.cooperativehorse.com. Yep, somehow I also ended up with the horse who obsessed me throughout my entire life ^_^ I always loved Connemara ponies, how fantastic they were at jumping, their cute little faces and lush manes and tails. Everything about them I just loved, especially the dapple grey ones. I felt sad when I grew to the height I am at now and realised that I would never be small enough to ride a Connemara, but low and behold, my friend heard of a certain 5yr old who’d just arrived from Ireland. I went to try him, and found that he was purebred Connemara, just the right size at 15.3hh and a stunning dapple grey colour! my dream is the Frisian horse I like since I was a child but I have financial problems because here in Italy there is a lot of crisis, but I hope that my dream will come true. It’s absolutely true! Dreams come true. We never had enough money for a horse and i have already given up any hope. But then one day changed everything and now i am the proud owner of a beautiful mare. I never believed it would come to that but it happened. Thus I started believing again. And your page convinces me ever again that everything is possible. The stuff you do with batman is breathtaking! You are really inspiring. Han är ju verkligen dö-läcker! Jag hade väl inte exakt en sådan häst som Puch som min dröm, jag hade snarare tre olika raser. En paint/mustang, en nordsvensk och en shettis. Jag hade aldrig kunnat tänka mig att jag skulle få hitta alla huvuddragen från raserna i en och samma hästkropp, men det gjorde jag! En arbetshäst i medelstorlek med shettis-lynne och en fin skäckfärg med lång lockig man :-) Det enda jag inte drömde om var väl fetman haha, men det kommer väl ganska naturligt med kraftigare hästar. Matilde, I completely understand! I was the exact same way when I was young. In America, we have a program called 4-H, which is sort of like Boy Scouts but for agriculture. 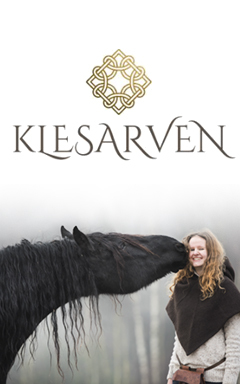 I joined the Hippology team and discovered Friesians, and fell in love. They are hard to find here in California, but it’s my dream to have one someday. I currently ride a Quarter horse, but I’m 186 cm tall so I need a bigger horse for sure. Thank you so much for sharing your life with Batman! He’s a dream!